I was in Boots today and I literally wanted everything which is not a good thing considering I had only £10 to spend. I ended up buying a quite expensive L'Oreal eyeliner that was £7.00 which I later learnt was amazing. Even though I could hardly afford drugstore make up I thought it would be a great idea to go and rummage through the more expensive brands and of course I wanted basically everything. ( what a great idea Sinead ) So I ended up leaving Boots with a Wish list longer than the one I entered with! This is how this post came about I thought a girl can dream so I created this Wish list with three make up products I would buy if I had some cash. When I finished the Wish list I noticed a bit of a colour trend ,dark purple. 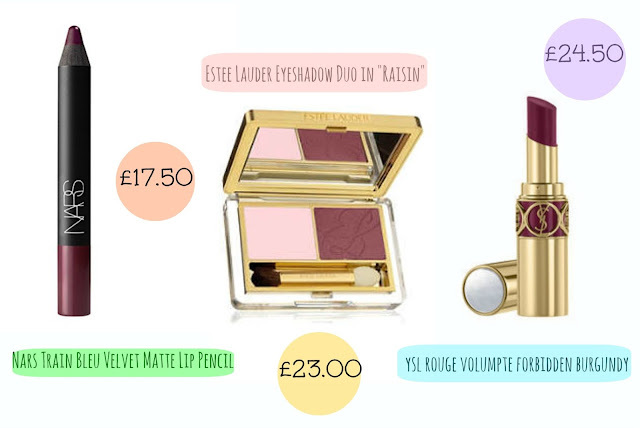 I love dark purple on the lips so when I came across the Estee Lauder duo eye shadow in a dark purple/brown colour I knew I wanted it. The packaging of the eye shadow duo is gorgeous with a real elegant lady manner feel to it. The first lip product I choose was the Nars matte lip pencil. I really want to own a Nars Product because I just love their packaging and I have heard great things about them as a brand. This lipstick is in Train Bleu and is really dramatic but yet beautiful. The last product that I want is the YSL Rouge Volumpte. I have been wanting one of these lipsticks for a while now for more than one reason , I really want to take some snaps of it. I know it sounds silly but it looks go lovely in photos and is something I need now. Do you want any high end beauty products that you can't afford ?